Reliance has introduced triple-cashback offer that includes 100% cashback that offers Rs. 400 worth vouchers on recharge of Rs. 399 or more. 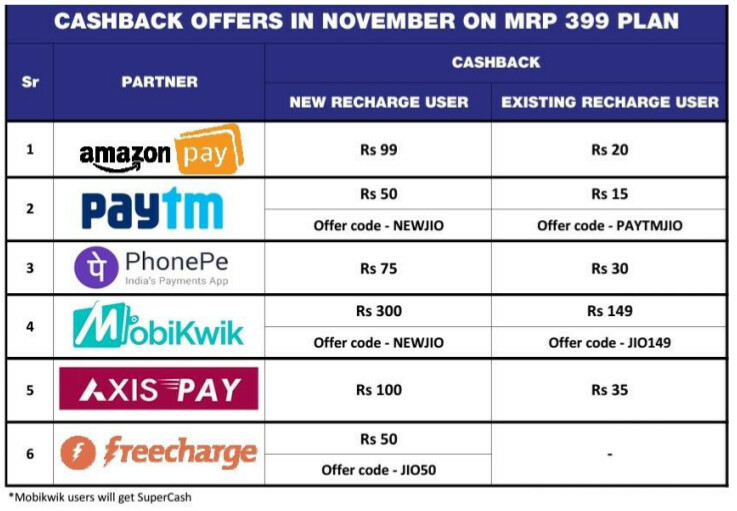 Jio had introduced limited period 100% cashback offer during Diwali last month.It already partnered with Amazon Pay, Paytm, PhonePe, MobiKwik and Freecharge for cashback up to Rs. 300. Recently it has partnered with Axis Pay to offer Cashback up to Rs. 100.Reliance Jio said that it has partnered with leading e-commerce players to bring vouchers of up to Rs. 1899 on every recharge. This move might be a reason to retain the users after Jio hiked rates of plans last month after Diwali. The 100% cashback offer might be a limited period offer so it might end soon. Update : Reliance Jio Extended it's Triple Cash Back offer till 15th December 2017.